Select a color Blue Green Orange Pink Yellow Custom! Fanny packs are coming back in a big way, and honestly I don't know why they ever went away! They're super useful, flippin' handy, and amazingly awesome! 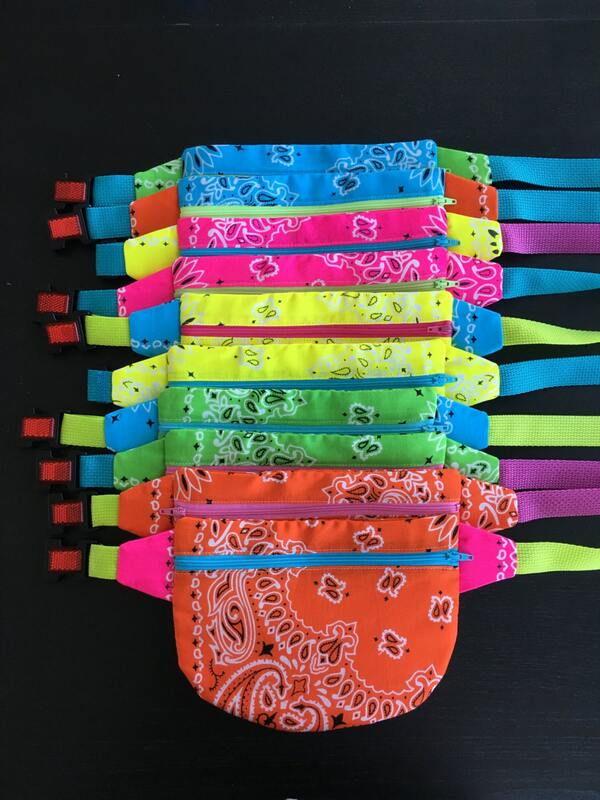 These fanny packs are made from a variety of handkerchiefs. Bright colored zippers and waist webbing held together with a reflective buckle (what?!) round out this perfect accessory. If you'd rather a more subdued color, just let me know and I'll whip one up for you. Perfect for moms, dads, boys, girls, grammas, grampas, and everyone in between. Scout troops, birthday parties, family hikes? No problem! I can make custom colored packs for them all. Just convo me and we'll figure it out. The fanny pack is extremely well made. Very sturdy strap, zipper was perfect, and works easily for little ones. I purchased for my youngest granddaughter. We had fun trying to decide on all the things she could put in her pouch. From doll accessories to snacks! Everyone at Christmas loved their earbud pouches! They are extremely well made. I bought Star Wars theme for the boys, flowers for the girls, and geometrical for older kids (and me). The key ring allows you to attach it to anything. I just love them and will be ordering more!